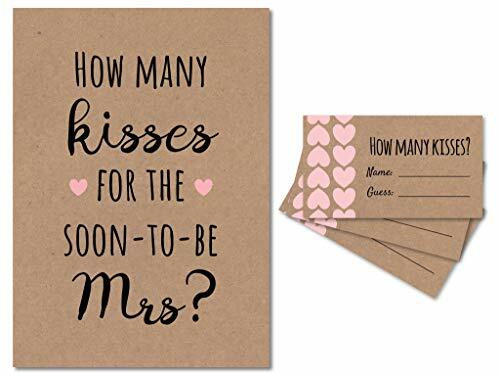 FUN FOR A VARIETY OF AGES - Fill a jar with candy and have everyone guess how many kisses are in the jar. GREAT FOR ANY BRIDAL SHOWER OR WEDDING SHOWER - Suitable for a bridal shower, wedding shower, engagement party. Fits many different shower themes and color schemes. BEAUTIFUL AND HIGH QUALITY - Includes one 5x7 inch sign printed on thick, premium 115lb cardstock and thirty 3.5x2 inch guess cards. If you have any questions about this product by Crown Bee Printworks, contact us by completing and submitting the form below. If you are looking for a specif part number, please include it with your message.